I believe everyone should raise SOME of their food. Even if it is simply a small pot with fresh herbs, I think it is important to do it. Why? Even if you only begin by growing a little basil in a pot, as you enjoy the difference fresh food gives your dishes, you will want to begin growing more fresh herbs. Then you may want to try a veggie or two. Even a tomato plant in a pot with some lettuce growing around it can be done no matter how big or small your growing space may be. I also believe it is important for children to learn the art of gardening. It’s important for them to understand the cycle of producing food, from seed to table. I also think it’s important for children & adults alike to understand the benefits of serving & eating food that is free of chemicals, food that you know has been grown in a safe & healthy environment. 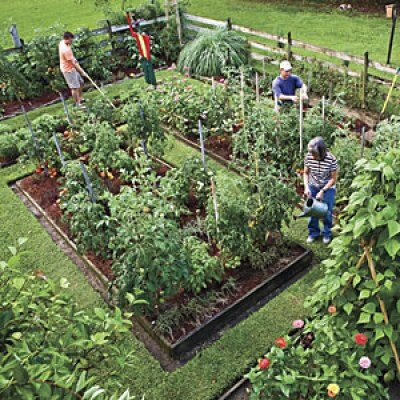 Southern Living is offering you tips & ideas to help you begin your first veggie garden or expand your current garden. Word of caution! Start small. It’s easy to get excited about all the great veggies you see, causing you to plant a garden thT is too big for you to maintain. Instead, plant throughout the season. Some veggies need the hot days of summer while others prefer the cool days of Autumn. Keep it manageable. Keep on planting. Enjoy fresh veggies throughout the year! Enjoy! Is that your garden in the photo? Very nice! I wish that was my garden. It’s a community garden. They are very popular out here in SoCal where the growing season is year round! I love being able to go to the garden for fresh veggies or herbs. Not much happening at the moment except for carrots, onions, lemons, and cilantro. Crazy combo, don’t you think? Thanks for sharing great insight!